Submaximal graded exercise is any physical activity whose intensity increases at regular intervals up to but never exceeding 85 percent of your maximum heart rate, according to the American Council on Exercise. Among the types of graded exercise tests normally used to find your aerobic capacity are a stationary bike and a treadmill test. Submaximal graded exercise tests can be administered to participants of various fitness levels, making the tests time-efficient and cost-effective. According to ACE, a single exercise testing session can provide an accurate indication of your current aerobic fitness level, and can be a useful tool for tracking your fitness improvements across a consistent workout program. Regular exercise can decrease your heart-rate response to a given exercise intensity. This cardiovascular adaptation is a sign that your aerobic fitness has improved. Clinicians may use submaximal graded exercise tests as a simple and cost effective tool to diagnose disease states, such as cardiovascular disease, and prescribe exercise programs to patients. Submaximal exercise tests indicate oxygen consumption, a measure of aerobic fitness, by recording your heart rate response during a submaximal bout of exercise. During a submaximal graded exercise test, your heart rate increases as your exercise intensity increases. The intensity level of the exercise you do before reaching 85 percent of your maximum heart rate is an indirect indication of your aerobic fitness. If you're a man, you can calculate your approximate maximum heart rate using the following formula: 220 – your age in years. If you're a woman, multiply your age by 0.88, then subtract the answer from 206 to find your maximum heart rate. However, for the most accurate information, consult a physician. 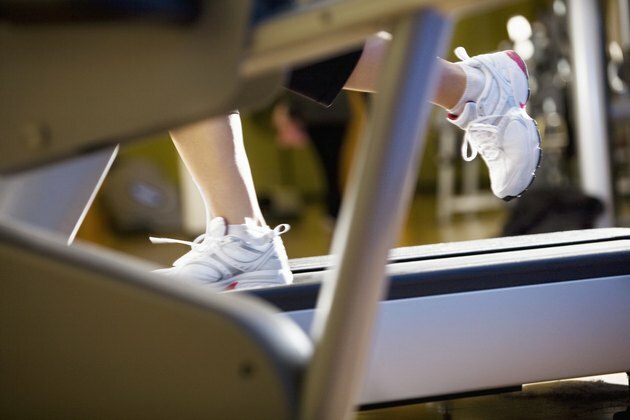 Preferred methods of exercise testing use the stationary bike and the treadmill. Many exercise test styles have been designed for each apparatus, with minor differences. During a typical graded fitness test, your weight, height, blood pressure and heart rate are recorded, and your maximum heart rate is calculated. You exercise at low intensity until you reach a steady heart rate, then increase the intensity. Treadmill tests increase elevation, and bike tests increase resistance. Speed remains constant for the duration of the test. Heart rate is continually recorded, as intensity is increased periodically. The submaximal graded fitness test stops when your heart rate reaches 85 percent of your maximum heart rate or you feel you cannot continue. For the most accurate results, a fitness test should be monitored, and the results analyzed, by a trained health professional such as a certified athletic trainer, an exercise physiologist, a nurse or a doctor. Maximum heart rate can differ greatly from person to person. Miscalculation of your maximum heart rate could lead to an overestimation of your fitness level and put you at risk of injury or harmful health consequences, as could any incorrectly conducted sumaximal graded exercise test. Physical Therapy; "Submaximal Exercise Testing: Clinical Application and Interpretation"
Exercise Physiology: Human Bioenergetics and Its Applications; George Brooks et al.